﻿ Cristiano Ronaldo: "Can I beat my goal record again? 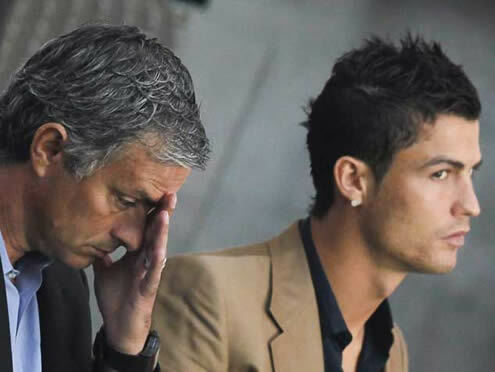 Nothing is impossible"
03.10.2011 » Cristiano Ronaldo: "Can I beat my goal record? 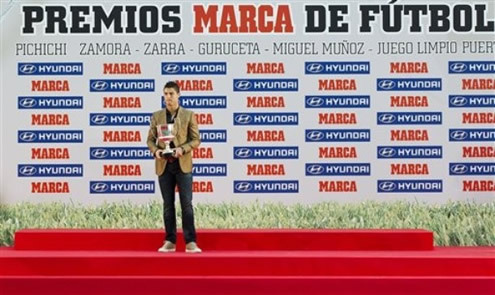 Nothing is impossible"
Cristiano Ronaldo received the "Pichichi" award from last season (2010-11), handed by Spanish newspaper "Marca". 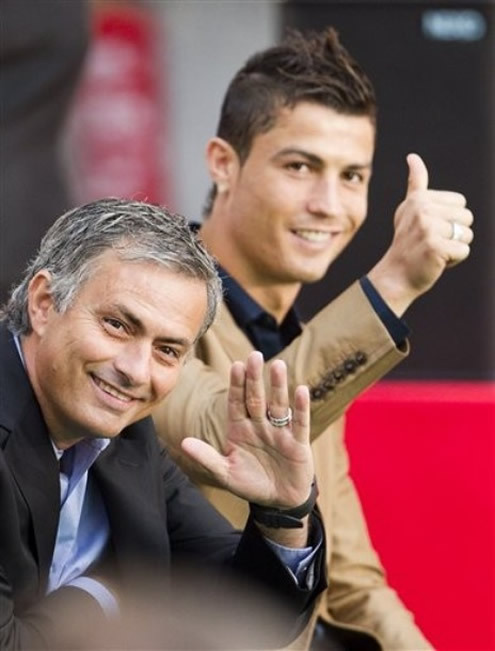 CR7 has expressed confidence and said he expects to beat his own record again. Ronaldo set an historical mark in La Liga last season, after scoring 40 goals (41 according to Marca) and he's the highest goalscorer of all time in the Spanish League, when accounting for a single season. The "Pichichi" trophy, which awards La Liga's highest goalscorer every season, got delivered to Cristiano Ronaldo earlier today, for his 40 goals scored in the 2010-2011 season (41 goals according to Marca, who are responsible for ruling this competition). As usual, Ronaldo showed his tremendous ambition and told everyone that nothing is impossible, when asked if he can beat his goal record again. Cristiano Ronaldo: "In football, nothing is impossible." replied the Portuguese player in what could dangerously be seen as a marketing campaign for Adidas, by his sponsors from Nike. The Portuguese player then continued with his statements: "Every current record set can be beaten and I hope I can leave behind that mark once more." One of the journalists from Marca asked Ronaldo for him to comment on what he believes it was his best goal scored in the 2010/2011 La Liga campaign. CR7: "Every goal is special for me. I want to thank all my teammates and the entire club for helping me in winning this "Pichichi" award", replied the Portuguese in an attempt to share his glory with his Real Madrid friends. However, Cristiano Ronaldo reckonized there could be more players attempting to beat his 41 goal record set in La Liga, but says in advance, that whoever does it, will certainly deserve the trophy. 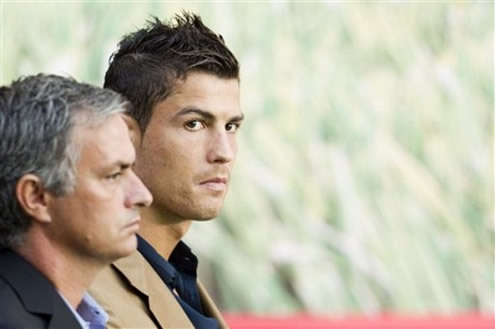 Ronaldo: "Let's see what happens in the next years. We never know if me or anyone else will be able to beat that goal record. Whoever manages to overcome it, will be a worthy winner." Last season, Ronaldo left Lionel Messi behind in the Spanish League goalscorers standings, with a very big lead, after having score 10 goals more than the Argentinian, who ended up with 31 goals in La Liga. Cristiano Ronaldo continued to be questioned and he was asked to comment his two assists made last weekend, in Real Madrid against Espanyol. Ronaldo: "It's part of my job and assigned tasks to help my teammates with assists. They also help me and assist me for goals several times and I do the same for them. We always have to do the best we can to help the team and the club. We have to win, and we mutually support each other." When doing a final balance and analysing his individual performance from last season, Cristiano Ronaldo has no doubts in recognizing he had a good year. 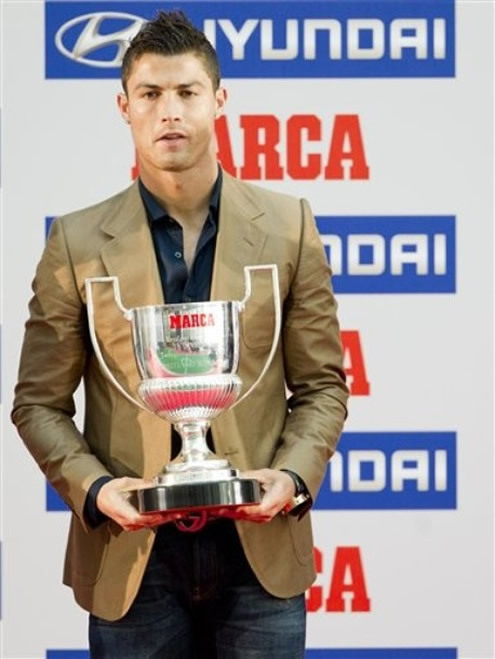 Ronaldo: "It has been a good season for me. The highest goalscoring award is important, but if we keep helping each other as true teammates, we'll get to the trophies." 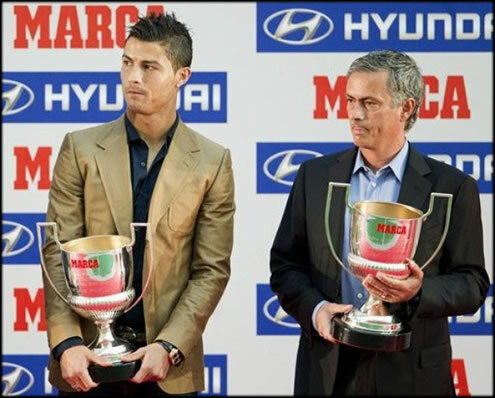 Besides Marca's "Pichichi" award being awarded to Cristiano Ronaldo, there were also a few other personalities who received honors. 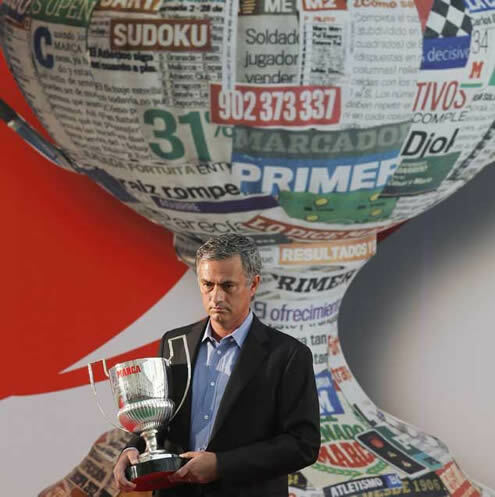 Real Madrid coach, José Mourinho, received the "Miguel Muñoz" trophy, for the best coach of La Liga, Lionel Messi from Barcelona received Marca's "Di Stéfano" trophy for the best player of La Liga award, Álvaro Negredo from Sevilla got the Spanish highest goal scorer trophy and Victor Valdés from Barcelona was handed the less beaten goalkeeper in the League award.